It’s such an exciting time here at Sew Inspired and to celebrate, we’ve decided to join Facebook & Twitter to create a fantastic community for lovers of all things sewing! We want to create a sewing ‘home from home’ for all of you to share inspiration, hints and tips and education. Whether you’re a beginner or pro, you’re all welcome to post your creations, handy tips and help one another on their sewing journey. 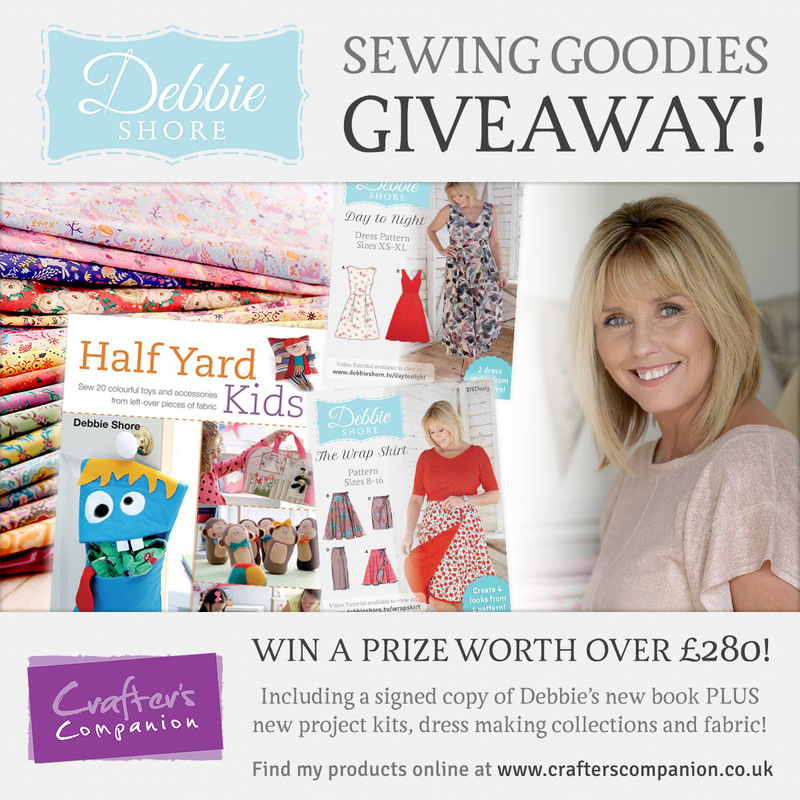 To celebrate, we’ve teamed up with Debbie Shore and are giving one lucky winner the chance to win a FANTASTIC SEWING GOODIES BUNDLE worth over £280!! In the bundle you can win: a signed Half Yard Kids book, 5 dressmaking patterns, 6 new box kits, 6 metres of gorgeous fabric and 6 of Debbie’s brand new English Paper Piecing packs too! See the prize gallery and enter HERE!!!! Issue 4 is launching tomorrow…and here’s a little note from Debbie telling you what you’ve got to look forward to in our latest issue..
I’ve called this ‘the home comforts issue’ as I know everyone loves their home and making it cosy! As well as a free Wrap Dress pattern and five projects perfect for beginners on the free CD-ROM, you’ll find designs for a handbag pin cushion, hedgehog pin cushion, sewing machine cushion and more! Of course there are lots of other projects to tempt you too, from a practical pie-carrier, pretty cake frill, a kitchen organiser, a needle case and a reversible apron, all made using your free baking-themed stencil. Here’s a little sneak peek in the meantime – we hope you enjoy! Furthermore, The Great British Sewing Bee is starting on Monday 16th on BBC1. We’re bursting with sewing excitement. Debbie Shore will be ‘sewing’ along with the Bee – so look out for videos every week on our social media channels and blog! 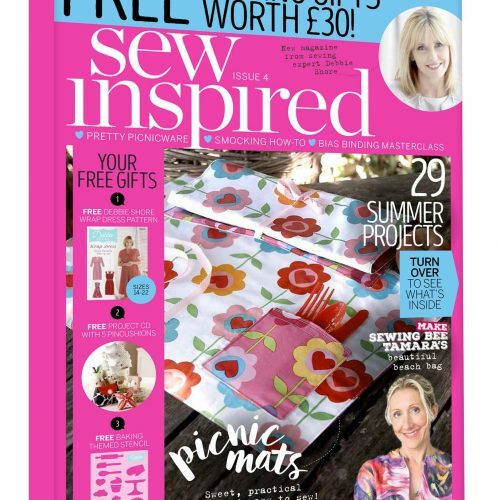 Don’t forget, if you haven’t already – SUBSCRIBE to Sew Inspired now.